We are on a roll with these Chef’s Tables. I am just little Mrs. Foodie Planner. We just came off an incredible and delicious, mind-blowing globally influenced Creole meal with Chef Jody Morphis at Blue Denim in Greensboro (aka Jeansboro). Fortunately for our restaurants, but unfortunately for the blog reader, some of our events have sold out before I even get to announce it on my blog. Today, I’m ahead of the game to announce our June 19 Chef’s Table will be with the one and only Full Kee Gourmet Chinese Restaurant and it is going to be epic! It’s the best Chinese in the Triad and a favorite of so many people here. Here are the details! Click here to get tickets if details don’t matter . Folks….we’re going to High Point to share with you the BEST BEST Chinese in all the Triad. Full Kee has been renowned for its “gourmet” Chinese cuisine for over 10 years. Nope, this isn’t your typical takeout fare. It’s elegant dining and gourmet Chinese and I promise you, you do not want to miss it. As former owner, George Yu, has retired to the Sunshine State, new owner Sue Chen has helped Full Kee retain and exceeed its former glory. Chef Carlos Lopez learned everything he knows from George and has further refined and enhanced his culinary talents with Cantonese cuisine. From the handmade dumpling wrappers to delicate stir fry bass and savory boneless duck, you’ll be impressed with this family-style event at Full Kee. Reserve with a ticket here and you’ll join us at our table on Wednesday, June 19 at 7:00pm. A reminder of our pricing: Your ticket price of $35 INCLUDES your multi-course dinner as well as tax and gratuity associated with the meal. Beverage (and gratuity for the purchase of beverages) are not included in the ticket price. Please take care of your server on any beverage service. A reminder that seating will be limited. We’ll see you on June 19! Come early for drinks and relax for a bit. Full Kee has a full bar and a great wine program. ** It’s super fun to attend Chef’s Tables with friends! We totally get it. However if you are unable to arrive early and all at once with your party, please let us know in advance that you’d like to be seated together and we’ll make every effort to accomodate your request. This is especially helpful if your tickets were not purchased under one name. This entry was posted in foodie b'eat, Restaurants, You Should Eat Here! and tagged A Chef's Table, chef, chef's table, food tasting, foodie, foodie event, Fun with friends, High Point, Triad on March 27, 2019 by triadfoodies. This might be more of a refresher for some of you who are more regular readers of the blog. Here’s a checklist of some of our fave Asian spots across the Triad. It’s all in my latest CHOW article in YES! Weekly. By the way, since we went to press, we found another that we really love. nOma Food is a new fast casual restaurant on Battleground Avenue. They officially open Monday, August 24. You must check them out. They are fab. Especially love their curry and the beef rice bowl! Enjoy, foodies! PS…if you don’t see a fave, let me know what I’m missing. 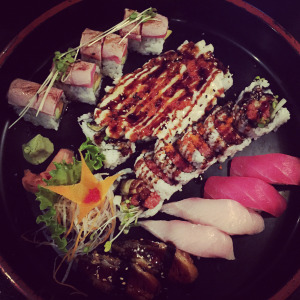 This entry was posted in foodie b'eat and tagged Asian, Chinese, Greensboro, High Point, Japanese, Sushi, Thai, Triad, Vietnamese, Winston-Salem on August 23, 2015 by triadfoodies.